A: I am originally from Chicago, IL where I first started working in veterinary clinics. I went to Tufts University for veterinary school and graduated in May Of 2013. I am now a small animal veterinarian in Denver, Co.
A: I play guitar and love music. A: I love that World Vets provides veterinary care and education where it is not always available. The trips are also a great opportunity for the veterinary team to learn from each other. Getting to see new countries and making friends with people from all over the world is great too! A: The opportunity to help people and animals alike. 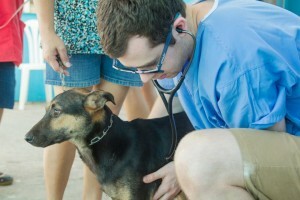 Providing good quality veterinary care in places where it is otherwise not available. A: My favorite World Vets moment was performing a spay surgery as a nearly graduated veterinary student, right next to Dr. Joe Kelley as he also performed a spay in Roatan, Honduras. Two years prior, Joe had taught me how to do the surgery and helped me through my very first spay. It was great to work with him again and know that now I could perform the surgery unassisted.